Great domain names (take a look at Google and Yahoo, for two) say so much while saying so little. In addition to being memorable, a domain name needs to accurately reflect your brand's voice and be nearly impossible to misspell. Finding the right name for your brand is crucial, because incorporating a combination of SEO, simple spelling, and brand identity into the domain name leads to a higher chance of being located in search engine results. Simply put, businesses that are easily accessed online get more customers. Color schemes are more important than customers realize. Different colors have the ability to evoke emotional responses, such as calm, happiness, or frustration. When it comes to using colors in your website design, it's essential to consider your company's niche, target audience, branding, and the elements of color theory. What colors will your target audience respond to? If your color scheme is similar to your logo and branding, is it overwhelming or pleasing to look at? Are you trying to convey your brand's voice with a bright and spunky orange or a professional, calming blue? Regardless of your choice, spending the time to research the best color options will give your visitors a good impression. When thinking about functionality, there are a few matters to consider. Namely, is the website functional in the literal sense? Are there loading issues or broken links? Are the site's security features adequate for your business's needs? In addition to these operational issues, it's crucial to view your website's features from the user's perspective. Are the contact forms, surveys, and customer feedback sections of your site working properly? One or all of these functional issues can prompt a customer to leave your site. Websites that are easy to use are more likely to garner customer interest and encourage business. Usability can be increased by displaying product and service information in a clear, concise manner. Make sure your website has all the features a customer would need for the site to be easily accessible. If a viewer is reading your blog and wants to subscribe to an email newsletter, do they have to hunt for the opt-in form? Is your contact information clearly displayed? Does the layout of your website encourage social sharing and further interaction with your brand? 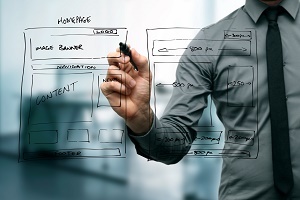 These key elements are essential to review when optimizing the usability of your site. Placing calls to action on your website encourages customers to contact your business. A friendly suggestion, such as "Contact us today!" demonstrates that your business wants to develop a relationship with its customers. It's important that calls to action are appropriate for a visitor's level of engagement with your company. If they're just discovering your brand, invite them to subscribe to your email newsletter. If they're already a loyal customer, perhaps they'll enjoy participating in your brand's loyalty rewards program. Regardless of what you're asking visitors to do at your site, always include a call to action at least once on each page. An on-site blog helps keep customers informed about the latest products, company events, and industry-related information. Featuring a blog on your website is a great way to connect with them, especially if your posts encourage readers to interact with your brand. Keeping your blog regularly updated informs customers of your brand's values and desire to promote communication. By regularly providing readers with fresh, helpful, engaging content, your brand becomes a trusted resource and an industry authority. Whether you're developing new webpages or optimizing existing ones, it's critical to have clean, SEO-friendly code. By taking the time to improve your site's code, you can increase the overall return on investment. SEO-friendly code acts as a guide for search engine spiders by providing a clear picture of your site's content. Certain CMS services, such as WordPress, provide plug-ins designed to simplify the process of cleaning up code and increasing search engine rankings. Since it requires little coding knowledge (if any), WordPress is a great resource for companies struggling to drive traffic to their websites. As technology progresses, the number of internet browsers is steadily growing. From Internet Explorer and Chrome to Firefox and Safari, it can be frustrating to keep up with them all. When creating a website, it's vital to ensure that your website is reachable from multiple browsers. Specifically, your site should load properly on all major browsers - including older versions. Failing to take this step may exclude a large section of your customer base, which can be a costly consequence for a growing business. Statistics indicate that the use of mobile devices to conduct online searches has increased significantly in the past two years. In fact, approximately 95% of mobile device users count on their devices to search for local products and services. To effectively reach this growing population of mobile users, businesses need to be sure that their websites are available from any device. For a large company with an existing web presence, it makes sense to develop a separate, mobile-friendly website designed to perform well on any device. On the other hand, a business planning the launch of a website would be better served by choosing a responsive design capable of adapting to any device. Integration with social media is no longer a novelty - it's a requirement. As technology makes information sharing more convenient, businesses lacking social media integration fail to take advantage of what has been likened to modern day word-of-mouth advertising. Social media provides a venue in which customers can promote your brand, provide reviews, and stay in-the-know about your company's latest news. Written and visual content, including product images and branded video, are easily distributed on platforms like Facebook, Twitter, Pinterest, and LinkedIn with the addition of social sharing buttons on your website. Spam, spam, and more spam. That's what some businesses receive in their comment sections, contact forms, and site forums that don't have captcha tests in place. These tests (you'll recognize them as the random letters and numbers typed before submitting a web-based form) differentiate humans from robots. Adding these short tests to your contact forms will ensure that only humans are able to use your site's resources - saving your business time and money. With the evolution of technology, newer and more advanced security risks threaten to compromise your website's integrity. From malware and viruses to malicious apps and the threat of hackers, websites must prevent security breaches on both the front ends and back ends. Websites built to conduct online transactions, such as ecommerce sites, need additional security measures to protect customer information. To reduce the potential for browser-based threats, businesses must add SSL certificates to their websites. During development, it's critical to review the security features included in your site's framework and design. Businesses also need to conduct regular security checks or work with a provider who offers this service. Due to Google's search algorithm changes, greater priority has been placed on local searches. Review services, such as Google and Yelp, can be instrumental in generating qualified leads for businesses. Now, when customers search for a local business or product, they're often greeted with reviews about a company on the first page of search engine results. Obtaining reviews on third party websites adds to your brand's credibility, while making it simple for viewers to gain insight into customer satisfaction associated with your brand. To guarantee customers are able to leave reviews about your company, make sure to claim your business profile on third party review sites like Google and Yelp. You can than create a call to action on your website that will prompt a client to write a review and lead them to that particular third party review service. Google offers a great way to connect your Google+ business page reviews with your website. As long as you have an address for your business that qualifies and a Google+ account, you can search for your business page and if one doesn't exist already you can create one. Once Google verifies that you're the owner you will see your Google+ business page linked to your website whenever it appears in the SERP's. Similar to offsite reviews, customer testimonials can be used to promote your business. By featuring customer testimonials on your site, you demonstrate your company's skills, products, and commitment to customers. If you already have a loyal customer base, reach out to a few and solicit online reviews. If they're willing to provide a recorded testimonial, take advantage of this opportunity to create a branded video. The more genuine, detailed testimonials your company receives, the greater your chances of gaining new customers. Though Google stopped accepting page verification requests (not to be confused with Google+ business page verification, which is still active), it remains essential to complete Google+ author verification for your site. Linking site content to specific authors using Google+ profiles allows the search engine to easily distinguish between content created by a human and content of a lesser quality. Completing the Google+ author verification steps also ensures that the author's byline and photo appear in SERPs. When looking for relevant content, customers greeted with the promise of information provided by a real person are more likely to click on the link. As a bonus, claiming your brand's byline in SERPs makes it easier for customers and peers to connect with it. Between Google Analytics, Google Webmaster Tools and bing Webmaster Tools, web developers have the mechanisms necessary to accurately and efficiently calculate return on investment. For both traditional and mobile websites, these instruments can be used together to monitor traffic, engagement, and conversion rates. After digging deep into the data, it's possible to uncover which marketing campaigns work best and which are underperforming. These valuable insights into why customers come to, stay on, and leave your website help your team perfect marketing strategies and adjust engagement techniques to maximize results. Since your branded online presence acts as a 24/7 storefront, it's essential to simplify the outcomes measurement process by using Google Analytics along with Google and bing's Webmaster Tools. When you sit down to read a book, what's the most helpful section to review first? Typically, it's the table of contents. Acting as a summary of the book's details, the table of contents provides a snapshot of material found within. Similarly, a sitemap provides visitors and search engines with the information to easily navigate your website and discover its contents. To keep your site up to date, it's necessary to revise the site map as new pages are added. Google Webmaster Tools simplifies this process for you. When designing a website, it is crucial to write high quality, original content that is relevant to your company and products. Everything from the quality of your content to the keywords used affects your site's ranking in search engine results. Keyword research can provide topic ideas and, if used sparingly, will help customers quickly locate the content they're seeking. To increase the appeal, each web page should have no less than 150 words and should include links to credible resources and other pages on your website. More than providing information, the content published on your site should be written to echo your brand's unique voice. Before publishing, use a tool like Copyscape to ensure that it passes duplication standards. Posting duplicate content on your website will result in steep penalties from Google, including possible removal from search engine results. Given these 24 aspects of website development and design, it's clear that there are many factors to consider when creating a branded website. In addition to increasing traffic and generating leads, your site's design, navigation, and content must engage customers and inspire further interaction with your brand. As you build a website, review the tools and information outlined in this guide to ensure that your site has the tools required to succeed.